Validation – peer reviews are the best! I’m still walking on air, despite discovering Amazon UK’s pitiful inability to support editorial reviews for indie author-publishers. 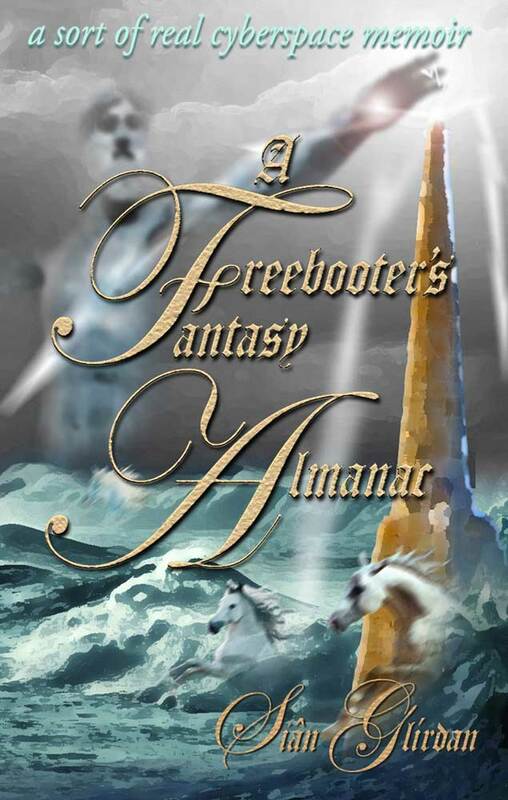 Yesterday I received a splendid review from one of A Freebooter’s Fantasy Almanac beta-readers, Ronald E. Yates. I say yesterday, but in fact this came to me last Friday and promptly fell into the swirling vortex that was my email inbox, thanks to the dizzy success of the blog tour that had me zipping all over cyberspace the whole week. Ron’s review lay there until yesterday morning, when I finally came up for air and recalled seeing his mail and attachment ‘over the weekend’, and then promptly forgot all about opening it – because I hadn’t… *blushes deeply*. Enough wittering for now – here’s what Ron had to say about our bouncing babe. Writing, as any author will tell you, is an intensely personal endeavor. We scribblers pour heart and soul into the scenes and incidents we create or recreate from our own lives. That’s what makes good writing unfeigned and heartfelt and it’s what brings readers back to our work again and again. This is not a linear narrative or memoir, but an effort peppered with original poetry, painful recollections of personal tragedy and suffering, and inspiring reminiscences of happiness and exhilaration. It is a book interleaved with both fantasy and reality—a challenging work that will carry the reader on a journey of discovery. It takes courage to write like this because in doing so, Siân Glírdan has opened herself up to great scrutiny. No doubt the impetus for this work is as much catharsis for her as it is an unearthing of emotion for the reader. Climb aboard for a cruise into an inspired sea of illusion and imagination, moored by authenticity and unremitting experience. To say I was overwhelmed with gratitude, to be frank, is putting it mildly. This is not only because Ron has said nice things, but mostly because he ‘got’ what the Almanac (and, by osmosis, myself) is all about – exploring your own fantasies and hidden worlds as far and as hard as you can. To paraphrase him, writing fiction is, or should be, an intensely personal activity. If you can’t put yourself wholly into it, then you are doing yourself and your readers a disservice. In an altruistic light, freebooting is comparable to ‘standing on the shoulders of giants’. As human beings, we are always learning from those who go before us. Even the best of us cannot become that way without using a blueprint, a model of inspiration or even excellence; working on a concept to improve and elaborate on it. Or, in the creative arts, to take what evokes our passion and imagination and take it on to the next level, or even in a completely fresh direction. In a post-modern world, where we’re told everything is recycled in some way, it’s hard to be truly original, to be a pusher of boundaries. I am a former foreign correspondent for the Chicago Tribune and Professor Emeritus of Journalism at the University of Illinois where I was also the Dean of the College of Media. To receive praise from such an accomplished academic and seasoned professional journalist is just breathtaking. In fact, I’m still pinching myself and keep looking at the word doc to reassure myself that he enjoyed my book and understood it so well. I’m posting this as peer validation, author to author, but in truth to receive such support from a person like Ron, who has risen to the heights of a life filled with writing, is humbling and like bathing in the cool shade of palm trees on the edge of a warm tropical beach. Thank you so much, Ron, for letting me know I’m on the right path, even if the sales and the reviews never come, because I’m choosing to follow my own trail, writing about what interests and propels me as best I can, and not ‘settling’ for what sells, or will ‘do better’ if only it conforms to the familiar and ‘easy’ routes to popularity. The books I’ve loved best have always been the ones that challenge and move me profoundly. I want to write books that challenge and move the reader. Books that I want to read as well, even if that means writing them myself. is currently only out on Amazon Kindle for £2.10 ($2.99). It still lacks a Foreword so the paperback edition is waiting on that, but is expected to be available from all good online and high street bookstores (via ISBN ordering) by the end of July. Wow!!! Now there’s the kind of reviews we only dream about!!! And what you wrote about it was so expertly written as well. Bravo!! This is an awesome post, don’t miss reading it all. Certainly is, Joy! 😀 Praise coming from someone with a similar outlook and passion as yours, and whose work you admire is always the sweetest. And the thing with memoirs is that they’re so deeply rooted into you, it’s hard to detach from what’s said sometimes. Congratulations! Reliable praise indeed. I am so pleased for you. I know how strengthening such reviews can be in the struggle for critical acclaim, if not more widespread recognition.